Can Rougned Odor Be Charged With Assault for Punching Jose Bautista? 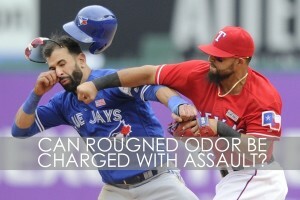 Home » NEWS » Can Rougned Odor Be Charged With Assault for Punching Jose Bautista? Did Rougned Odor Assault Jose Bautista Under Texas Law? If you live in Texas, have a pulse and have absolutely any contact with the outside world, you are very aware of the incident that occurred between Texas Ranger’s infielder Rougned Odor and the Toronto Blue Jays’ Jose Bautista during last Sunday’s game. If you have no idea what I’m referring to, STOP reading, watch this video and then come back and finish reading. Bautista was attempting to break up a double play at second base by taking a hard slide at Odor’s legs (which Odor avoided). After the slide, Bautista quickly stood to his feet and squared up to Odor. Odor pushed Bautista and both men went to throw a punch, but Odor was quicker and landed a strike directly on Bautista’s jaw, causing Bautista’s sunglasses to fly and the benches to clear in an all-out brawl between both teams. Under Texas law, if Odor caused Bautista physical pain or even if this physical contact was offensive, Odor could theoretically be charged with assault. Some know (but most don’t) that it doesn’t take much to be charged with a Class A misdemeanor Assault in Texas, even less for a Class C Assault. A person commits the offense of assault in Texas if that person intentionally, knowingly or recklessly causes bodily injury to another. Bodily injury as defined by Texas law means physical pain, illness or any impairment of physical condition. Theoretically, a simple pinch could result in a class a misdemeanor assault if it causes another pain. The law further goes on to provide that a person commits the offense of assault if a person causes physical contact with another when the person knows or should reasonably believe that the other will regard the contact as offensive or provocative (that is a Class C and is punishable by fine only). What are Rougned Odor’s Defenses to a Charge of Assault? While it is highly unlikely (and unprecedented in a sports context) that Odor would be charged with assault for his actions against Bautista on Sunday, he does have some viable defenses under Texas law. In analyzing the situation, it could be argued that Odor’s actions were a result of self defense. Texas law provides that a person can be justified in using force against another when and to the degree the actor reasonably believes the force is immediately necessary to protect the actor against the other’s use or attempted use of unlawful force. Watching the incident again, one can see that Bautista clearly committed an illegal slide by attempting to interfere with Odor’s legs. Had Odor not been able to dodge the attempt, it’s possible that this type of slide could have caused bodily injury to him, hence the reason this type of slide is illegal. Immediately upon rising to his feet, Bautista turns to face Odor in what could be perceived as a threatening stance. Odor, in an effort to distance Bautista from himself gives Bautista a shove to the chest. The shove results in Bautista winding his right hand back which could also be reasonably perceived as preparing to strike Odor. Odor, with reactions obviously much quicker than the sluggish Bautista, literally beats him to the punch and ensures that no further harm can befall him at the hands of Bautista. A reasonable jury could conclude that Odor’s reactions were justified and immediately necessary to protect himself from Bautista’s efforts to cause him harm. In addition to the potential defense of self defense, Odor could also raise the defense of consent. Under Texas law, a victim’s effective consent or the actor’s reasonable belief that the victim consented to the actor’s conduct is a defense to an assault charge as long as the conduct did not threaten or inflict serious bodily injury. In addition, consent is a defense to assault if the victim knew that the conduct was a risk of his occupation. Could a jury reasonably conclude that Bautista consented to the assault due to the fact that he should have known that a solid right hook to the jaw was a risk of his occupation – especially following an illegal slide? There are unwritten customs in professional baseball. Anyone who’s followed professional baseball for any significant amount of time has witnessed a fight break out in the course of such extreme competition. Ultimately, a jury could conclude that under these laws there was consent and that Bautista should have known that this type of action was a risk of his occupation. Will Rougned Odor be Criminally Charged with Assault? No, he won’t. Fights like this happen on the field of professional sports on a fairly regular basis (even more so on the ice during professional hockey games). In addition to clear defenses, law enforcement has broad discretion to determine whether a crime has been committed and prosecutors have broad discretion whether to pursue cases or not. It’s clear that that discretion is used regularly when these things happen (and I’m sure my prosecutor friends will comment and give even more reasons why this type of thing would never warrant criminal charges). Regardless of the national media coverage of the fight, Odor is now a folk hero in DFW. No, the only indictment being issued from this fight is an indictment on Bautista’s prior behavior and unsportsmanlike conduct. I’m not sure if this saga is over, but I would have to say that Bautista’s sentence has now been served — right off the end of Rougned Odor’s right fist.